​A new workshop using mixed media on Yupo paper mounted on wood cradle board. Watermedia, inks and acrylics combine to create whimsical floral still-life paintings. All materials supplied. Fun! Dates for each class to be determined depending on enrollment.---- Please check Studio Calendar for up to date information. -covering the basic techniques, with lots of stimulating applied projects: basic techniques of wet in wet, wet on dry, drybrush, washes (flat, gradated, glaze), negative painting, hard and soft edges, using masking fluid, lifting and removing paint/ fixing “mistakes”, using a grid, creating texture, painting from life and photos, and more! value and colour, composition, painting special subjects (brick, wood, stone, lace, glass, metal etc.). Bring your own materials or supply list supplied. Further explorations in watercolour focusing on landscape and portraiture, with a look at different approaches and styles of rendering the landscape and the portrait. Lots of exciting projects! Paper supplied, but bring your own paints and brushes, or supply list supplied. For those who want to explore more ways to use this exciting medium: painting watercolour on canvas, mounting watercolour on wooden panels, painting on different papers, including Yupo, travel sketches with watercolour and ink, and adding other media etc. Substrates supplied, but bring your own paints and brushes, or supply list supplied. Exploring basic techniques and a variety of applied projects with this versatile medium. Continued exploration in acrylic painting: colour, composition, using mediums, exploring different genres and styles. ​A new workshop using mixed media on Yupo paper mounted on wood cradle board. Watermedia, inks and acrylics combine to create whimsical floral still-life paintings. Most materials supplied Fun! Using a collage technique involving creating beautiful papers using National Geographic magazines and a strong citrus solvent- and then using them in small collages on wooden panels. No experience necessary just fun for all! 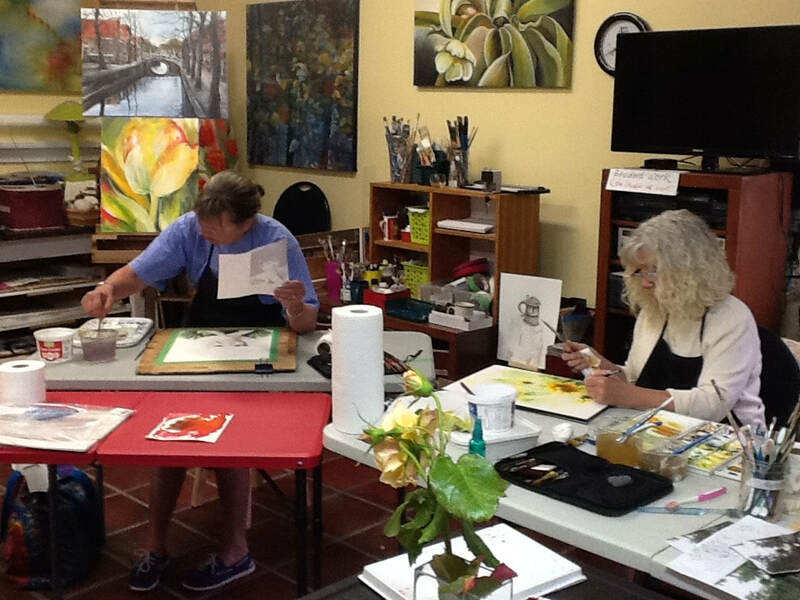 Using oil paint and cold wax medium, explore the interesting effects of this medium to create paintings of your own imagining. Two half days (as this medium needs some drying time between layers). $80 Saturday only; $140 for 2 days. 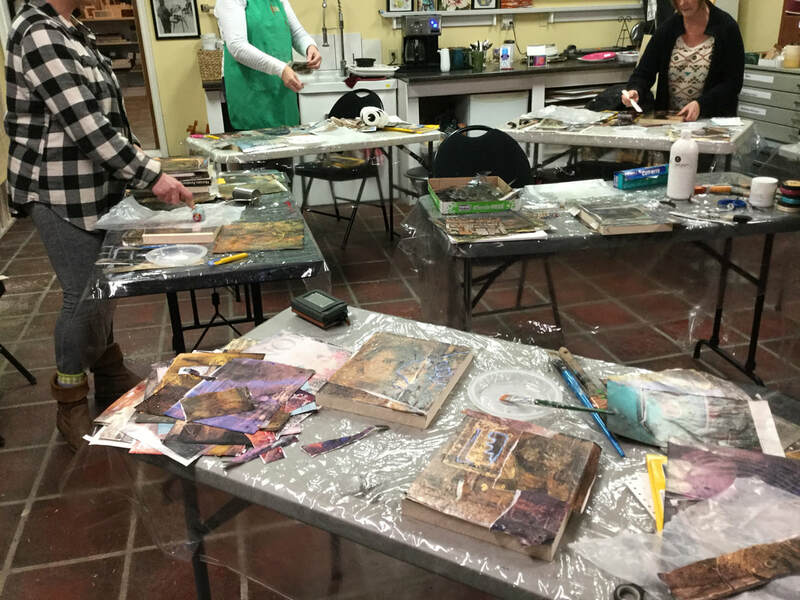 A look at the ancient medium of hot wax painting- layering, collaging, embedding, texturizing and fusing with hot air/ gas torch- to create abstract or representational works. All materials supplied: wood panels, encaustic medium and paints, india ink, oil sticks etc. Topics change each week-try 1 , 2 or all of the sessions!! !